AMC's Kids Outdoors Boston and Mommy Poppins Boston are excited to bring you a monthly series of guest blog posts on getting outdoors as a family. Mommy Poppins Boston is a free, online guide written by local parents for families looking for the best things to do, see, read, eat, learn, and play in Boston. Eagle, birdie, bogey, par… It doesn’t matter whether you know what these terms mean or not to have fun playing mini golf. What does matter is that mini golf is a great way to keep the whole family entertained. It offers something to do to pass a few hours on a summer evening and the chance to spend time outdoors - without the time commitment, training, or investment in equipment of the “big” version. Read on for some of the most popular Boston-area courses. Looking for a different kind of birthday party? Mini-golf can be loads of fun for kids of just about any age - no skills required. And a mini-golf party is often one of the most affordable options around. The party can be a simple gathering - a round or two of golf and cake and ice cream that you "carry in" - or a more elaborate affair that include golf, arcades, even bumper boats or batting cages, depending on the location. Nearly all the locations we've highlighted offer birthday parties; see their websites for package details. And while it's quite often possible to put together a mini-golf outing as a last-minute party, advance reservations for "official" party packages are usually required. Kimball's also has its own ice cream, a country store, bumper boats, driving range, pitch & putt, batting cages, and an outdoor grill and seafood shack. Route 1 Miniature Golf is one of the most well-known classic-style miniature golf course in the area - easily spotted by the orange dinosaur that watches over the course. The 18 holes feature roaring lions, gaping hippos, elephants, and more. You'll also find batting cages and an arcade. Save some time for a stop at the Dairy Castle, which serves up Richardson's ice cream, frozen yogurt and several soft-serve options. Party packages are available and include golf and ice cream. Picnic area is available. Parties are booked Mon-Fri 10am-5pm and Sat-Sun 10am-1pm. Reserve in advance. The 18-hole miniature golf course is well landscaped, with cascading waterfalls, water fountains, a cave, a castle and bridges. The course is fully lit at night. Families can also enjoy Richardson's ice cream, fill up at the snack bar, ride the go carts, hit a bucket of balls on the driving range, and play in the arcade. Castle Creek has four different party options that include different combinations of golf, go-kart rides, pizza, drinks, and ice cream. You may bring birthday cake and candles. Party plates, cups, napkins and utensils are supplied; you can bring a birthday cake and candles (no ice cream, food or beverages are allowed). A picnic area is available for birthday parties. Parties last 1 1/2 hours. You can carry in or have your favorite food delivered right to the golf course. Please call 508-653-4671 on weekdays before 8pm to make your reservations. Availability is usually limited, and parties are typically booked at least one month in advance. With Mulligan’s party package, the birthday person and seven friends can enjoy a round of miniature golf and then be treated to great food and presents on “The Deck." Package includes food, beverages, goody bags, paper goods, party coordinator, set up and clean up (starts at $159; additional options available). 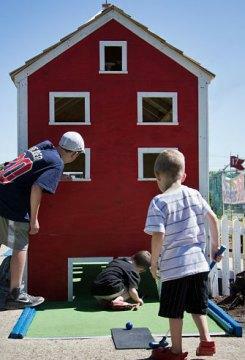 Hago’s features a newly renovated (2012) course that is bright, clean and fun - a classic mini-golf experience. The course includes great local references, including the Bruins and Fenway Park holes. You can enjoy Richardson's ice cream at the snack bar after playing. Hago's offers party packages; contact for details. Cost: Adults $8; Children (12 & under) $6. Discounts for same-day additional rounds. McGolf features 18 holes that offer a mix of variety and challenge in a beautifully landscaped course, plus a practice putting green for warm up. Also on the premises are a driving range (with year-round covered hitting bays (with heating available)), golf instruction and camps, and the McGolf Cafe and Creamery - select breakfast items; lunch and dinner; soft-serve and hard ice cream, frozen yogurt. McGolf offers party packages that include a round of golf and pizza, drinks, cupcakes and goody bags for the guests. Call for reservations and more details: 781-326-5999. This article originally appeared on Mommy Poppins Boston in July 2013.